Sonny Bill Williams made a superb return to Super Rugby on Saturday night, firing the Chiefs to a hard-fought five-point victory over the Blues at QBE Stadium in Albany. 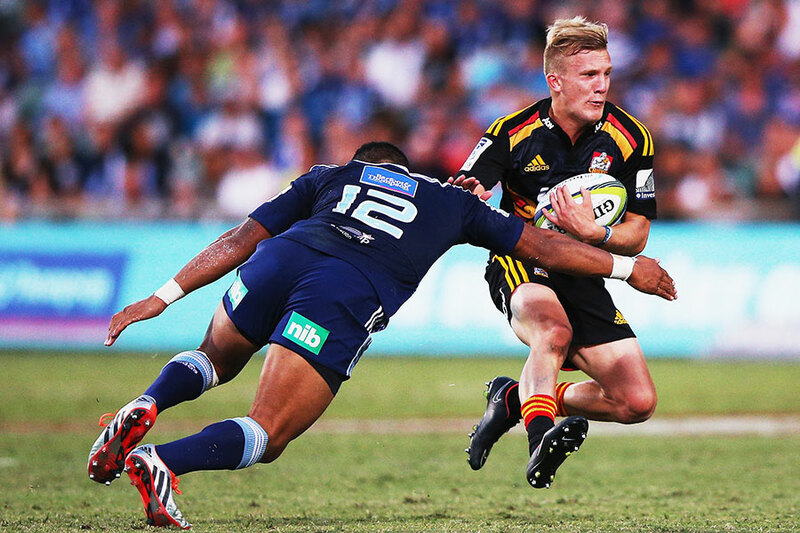 The cross-code superstar had a hand in both of the Chiefs' first-half tries, which proved the difference, and combined superbly with rookie fly-half Damian McKenzie. The Blues fought back strongly in the second half and almost stole the four points thanks to a flawless kicking display from fly-half Ihaia West. But a rustiness with ball-in-hand proved their downfall as several try-scoring chances went begging. "It's good to start the season with a win," Williams told Sky Sport. "The Blues hung in there right to the finish; I was a bit nervous on the sideline towards the end there but I'm just happy we got a win. "This time around coming back to rugby is a lot easier, the transition; obviously played the game before. But also just those (Chiefs) friendships I already had; so coming back, a little bit of hard work but I'm just lucky enough to come back to such a good side." Blues skipper Jerome Kaino was left to lament a slow start, but was happy with his side's fightback after the break. "I think those two tries early on really came back to bite us," he said. "But hats off to the Chiefs, they defended and played quite well." First points of the match went to the Blues after a feisty first five minutes, West getting the hosts on the board with a penalty after Sam Cane had been penalised for off-side. Many people had come to see Williams - the star attraction - and they didn't have to wait long for a glimpse of the code-hopper's skill as he showed wonderful hands to help send James Lowe in for the evening's first try. The Chiefs worked the overlap down the short side; Lowe treading carefully along the touchline to score on 12 minutes. And Williams was in the game again moments later as the Chiefs registered back-to-back tries to open up an early 14-3 lead. The former NRL star was the only one to follow through on a Brad Weber box-kick, the Blues back three left looking red-faced as he fielded the ball and produced a sharp offload to send Bryce Heem in untouched. Rising star McKenzie, deputising for All Blacks No.10 Aaron Cruden at fly-half, continued his bright start to the game with a third successful shot at goal; this time a penalty on 21 minutes after Blues lock Hayden Triggs had been penalised at the breakdown. And the 19-year-old was in the thick of it a short while later as he opened up the Blues in midfield and found Williams in support. A third try went begging though as Weber grassed a simple pass after the inside-centre had drawn Blues fullback Lolagi Visinia. There had been little to smile about for Blues fans in the first half, other than a couple of thumping hits from skipper Kaino, but they found some voice when West closed the gap to 11 points 10 minutes out from the break with his second penalty of the evening. But McKenzie answered for the Chiefs, the youngster with a booming long-range penalty from wide out. The Chiefs No.10 blotted his first-half copybook however when he reacted to a cheap shot from Blues outside-centre Hamish Northcott; West's third penalty making the half-time score 20-9 in favour of the visitors. After warning the Chiefs about their discipline late in the first half, referee Chris Pollock took just three minutes to issue the game's first yellow card upon the resumption; skipper Matt Symons given his marching orders for not rolling away at the tackle. West's ensuing penalty was again cancelled out by McKenzie though as the Chiefs rolled down field despite Symons' absence. The Blues had been largely dominant at the scrum throughout and it was again the catalyst for further points as the Chiefs' set-piece disintegrated and West kept the hosts in touch with another three points, reducing the score to 23-15 on the hour mark. Both sides seemed to struggle for fluency from there as mistakes, and the whistle of Pollock, began to dominate. The monotony was finally broken when the Blues mounted their most promising attack of the match, only for Northcott to spill the ball metres from the try-line. Pollock came back for a penalty however and West obliged, setting up a grand-stand finish for the final 10 minutes. But the Blues couldn't rectify their handling woes and were fooled into a long-range kicking battle at times as the game opened up inside the closing minutes. The Chiefs managed to keep their composure with McKenzie again prominent; the visitors holding on to claim the first New Zealand derby of 2015.